Prince Srivari Vidyalaya School, Chennai has advertised in the HINDU newspaper for recruitment of Teaching Faculty-Lady trained, PGT/TGT jobs vacancies. Interested and eligible job aspirants are requested to apply immediately.Check out further more details below. About School: Our schools are affiliated to the Central Board of Secondary Education, New Delhi. The schools offer L.K.G , U.K.G and I to X standards. Madipakkam School will be upgraded to Senior Secondary level from the year 2018 – 2019.English being the medium of instruction, languages like Tamil, Hindi and Sanskrit are also taught. How to Apply: Interested candidates are required to apply in person. 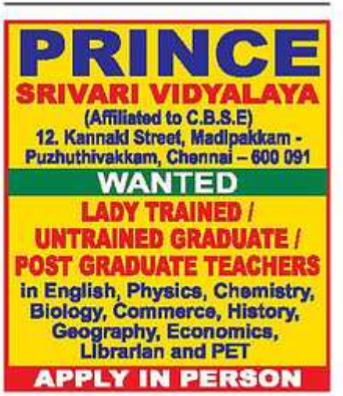 Reference: Recruitment Notification / Career Job Opportunities notice for Teaching Faculty -Lady Trained, PGT TGT Jobs on Hindu newspaper Dated 1st July 2018.